Do you find that you have trouble controlling your cravings?. In this post, we’re going to look at real, concrete ways that you can kick sugar and carb cravings to the curb. Believe it or not, sugar cravings have been linked to a lack of protein. It might seem counterintuitive, but the more protein you consume the less sugar you’ll crave. As a result, you should probably include protein in every meal just to be on the safe side. If you’re vegetarian, there are plenty of meat-free options that you can look into, such as black bean burgers and other similar foods. Don’t be afraid of letting a little fat into your life. Fat doesn’t come with all of the addictive properties (or at least not as strong of addictive properties) as sugar. Also, if you were to eat something that was high in fat, it would serve to immediately cut back on your sugar cravings. Think of it as an emergency off button that you press when in times of need. You might think that the logical way to cut sugar cravings would be to cut not just sugar out of your diet but to cut your diet down on calories altogether. However, this could not possibly be worse, not just for weight loss but for cutting cravings altogether. In fact, cutting down on calories to the point where you start yourself is only going to increase your cravings for sugar. This one also might seem counterintuitive, but if you eat frequently, you’ll tend to crave sugar less. Instead of having three large meals, you can opt to have six small ones instead. You can also have plenty of low-carb snacks on hand specifically for the purpose. This will set you up for good, measured weight loss and sugar cravings being stumped all at the same time. Sure, they might be a little more expensive. But whole foods are far better at reducing sugar and carb cravings than anything else. Plus, processed foods usually (always) have chemicals in them that only exacerbate the condition you find yourself in. It’s important to note that there are plenty of whole foods that pack as much of a flavor punch as processed foods. It’s just that they don’t come with all the calories too. You might have heard this one before, but it bears repeating: Water is crucial for both your weight loss and your overall health. Skip the processed cans of soda and go straight for the original H2O. Not only does staying hydrated make you look and feel great, but a low of food and sugar cravings are actually thirst in disguise. You’ll want to drink plenty of water to avoid those sugar cravings altogether. You might be thinking to yourself, “Well, if I can’t have sugar, I’ll have an artificial sweetener instead.” You should be wary of this thought process, as artificial sweeteners can be just as bad. They come with the fact that they’re processed food, and some people even claim that they have more sugar cravings after they have an artificial sweetener. That’s right. We didn’t say don’t drink caffeine or don’t eat caffeine, we said don’t use it. The reason for our terminology is the fact that caffeine is a drug no different from sugar. Caffeine tends to spike sugar craving levels and drive your blood sugar levels up the wall. It’s best to eliminate caffeine altogether, but if you can’t do that, at least reduce the amount you take in. It’s by not getting enough sleep that sugar cravings will often rear their ugly head. This is because your body’s going to be desperately craving some sort of energy, and you’ll be thinking that sugar is the best way of supplying that energy. Not only can not getting enough sleep spike your cravings, it’s also going to make it more likely for you to drop your diet altogether. What do you think will make it more easy for you to kick cravings? Having that sweet snack sitting right there, waiting for you to eat it, or not having any sweets in the house? 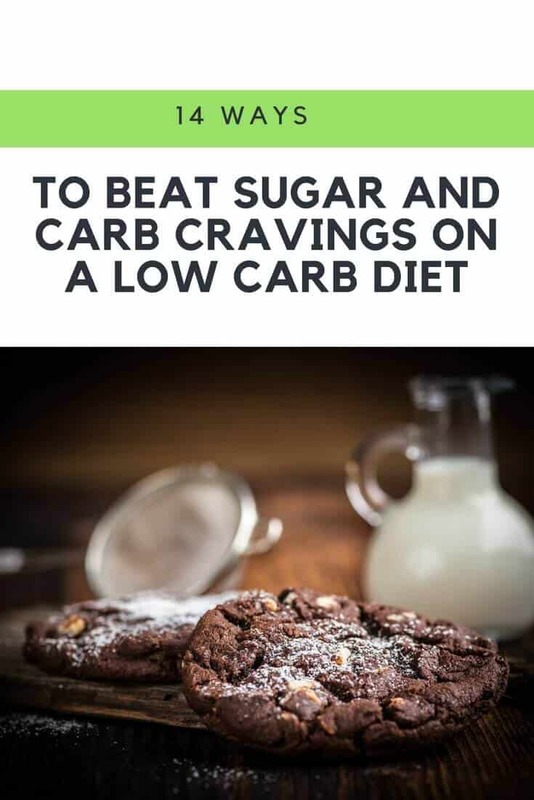 We know, it is tough, but if you’re serious about sticking with a low carb diet and cutting down on your sugar intake, this is the best way to do it. This also means avoiding that area of the supermarket where you’re bound to find sweet treats. We know you’ve probably heard this one a thousand times, but one of the best way to beat sugar cravings is to exercise on a regular basis. The basic reason for this is pretty simple: Serotonin is released both during and after exercise as well as after partaking in a sugary treat. If you want to cut out the middleman and get that sweet, sweet serotonin without gaining weight, then exercise on a regular basis really is the way to go. Don’t reward yourself the wrong way. By the wrong way, we mean with food. It’s hard to kick this habit especially when you consider that as children we were all conditioned to think of sugary, sweet food as a treat. We carry this tendency into adulthood, but all it does is add to our growing weight problem. The better way to do this is to treat yourself with a low-carb treat, or maybe even something that you like, like a new book or that vinyl album you’ve been eyeing for a while. We know this one can be very hard, especially if it’s something that you’ve trained yourself to do whenever you feel down. However, the best way to kick this habit is to do things that build you up, like exercising. Not only will this refocus your mind on something else, but it will be making a positive change in your life. If you’re having a really hard time avoiding emotional eating, that might be a sign that you could use some professional help. It’s not a sign of weakness to get professional help, especially for men who tend to avoid talking about their feelings. It’s a symbol of strength to be able to push yourself into an uncomfortable arena and then see it through to the other side. Plus, you’ll be losing weight like you wanted to do all along. Follow the diet to a tee. Diets work because they’ve been specifically honed and adjusted by professionals in order to best help you lose some weight. If you put yourself on a super low-calorie diet and cut out all carbs altogether, your diet is not going to last very long. That’s because you’ll need something else to balance out the carbs that you’ll be losing, such as fats. If you want to not just start a diet but keep a diet, then you’ll need to buckle down and follow every part of it. Sugar addiction is a real thing. Just like a typical addiction, you get serious cravings, you get that sugar high once you’ve satisfied those cravings, and then you get a slump or a crash and want to get started again with more sugar. The problem behind this is that it’s a never ending cycle. If you think you can break it on your own, best of luck to you. However, it’s much better to get yourself onto a low carb diet so that you can do it and have help every step of the way. While this list isn’t exhaustive, it should get you well on your way toward beating sugar cravings for good. Best of luck to you on your quest!